Here’s the gallery of photos from the actions, from (roughly) East to West! Thank you to everyone for participating in such positive and effective action! 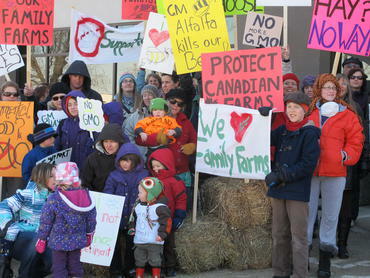 On April 9 2013, people in 38 communities across Canada rallied as part of the Day of Action to Stop GM Alfalfa! 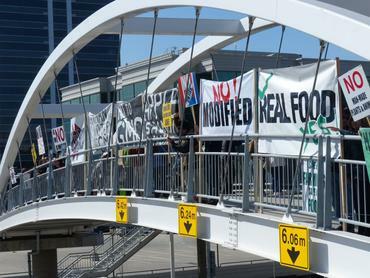 The Day of Action was called for by the National Farmers Union – Ontario and supported by the Canadian Biotechnology Action Network. At noon, outside federal Member of Parliament constituency offices, government and corporate offices in 17 communities in Ontario, and 21 locations in other provinces! Rallies in Ontario: Barrie, Belleville, Brantford, Goderich, Guelph, Hawkesbury, Kingston, Kitchener-Waterloo, London, Orangeville, Ottawa, Owen Sound, Port Colborne, Stratford, Toronto, Thunder Bay, Welland. Rallies in other provinces: Wolfville NS, Moncton NB, Montreal PQ, Lévis PQ, Brandon MB, North Battleford SK, Camrose AB, Calgary AB, Edmonton AB, Grande Prairie AB, Red Deer AB, Duncan BC, Kamloops BC, Kelowna BC, Langley BC, Nelson BC, Smithers BC, Vancouver BC, Vernon BC, Victoria BC, Whitehorse YT. Plus: Film Night, April 9 in Winnipeg. 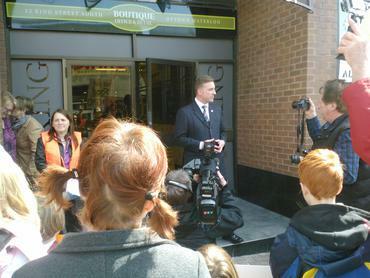 Many people met with their Member of Parliament on April 9 or after – presenting petitions that will be presented in the House of Commons. There were children in costume, organic cake (yum! ), lambs bounding around, great signs, haybales and lots of good will, courage and determination! Take a look! Join the movement! Click on the first photo to start the gallery (manual) slide show with captions! Roundup Ready alfalfa is engineered to be resistant to Monsanto’s herbicide Roundup. 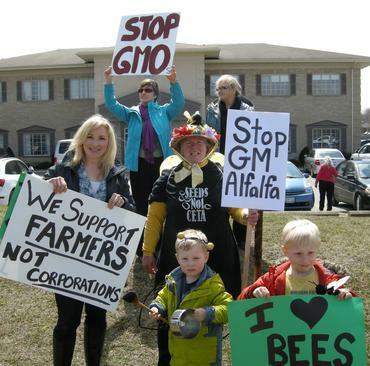 The GM alfalfa seeds would be sold in Canada by a company called Forage Genetics International but the company Monsanto has owns the genetic sequence in the GM alfalfa plant. See how much fun it is to take action? 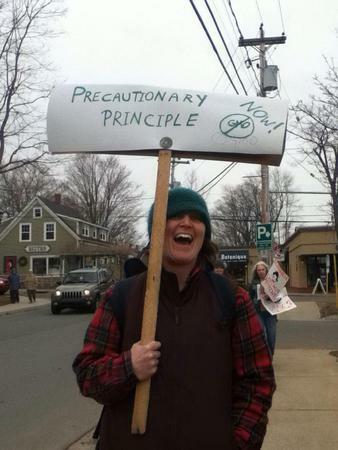 The precautionary principle advises us to take action to anticipate and prevent harm even when we don’t have conclusive evidence about causes. 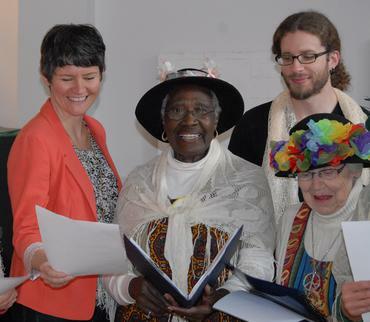 The Raging Grannies, and some honorary Grannies, joined a meeting with Megan Leslie, Member of Parliament for Halifax on April 9! 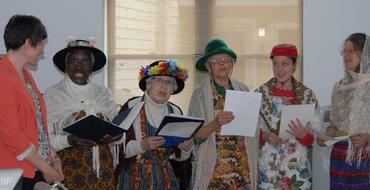 Halifax MP Megan Leslie joins in with the Raging Grannies, in protest of GM alfalfa! Many groups organized meetings with their Members of Parliament on April 9, only one included a sing-a-long with the MP! 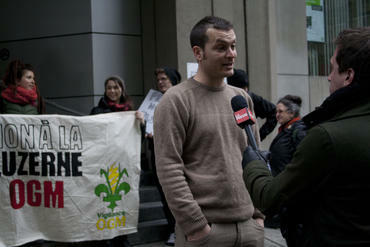 Watch the great TV news report, in French, where young National Farmers Union member Alain Rousselle, pictured here, describes why he is concerned about the first perennial GM plant being introduced. 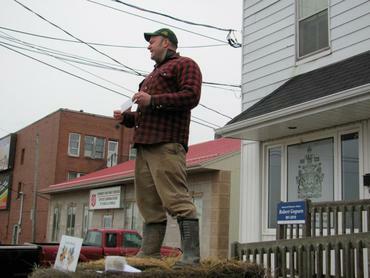 The rally in Moncton was hosted by the National Farmers Union New Brunswick. The company Forage Genetics International says they will introduce GM alfalfa into Eastern Canada first…farmers in the East say no! Check out the handout on GM alfalfa that farmers shared with one another on April 9 – prepared by CBAN and the NFU. 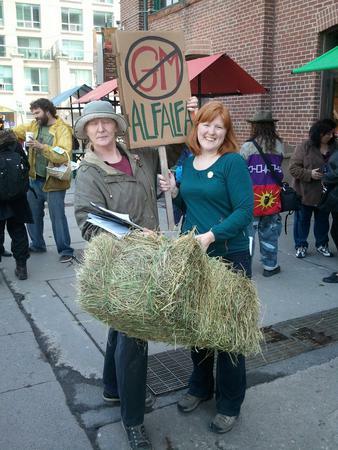 An organic dairy farmer explains his concerns about GM alfalfa in Montreal. 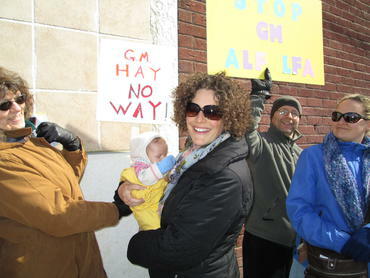 The Federation of Quebec Milk Producers passed a resolution against GM alfalfa in 2011. 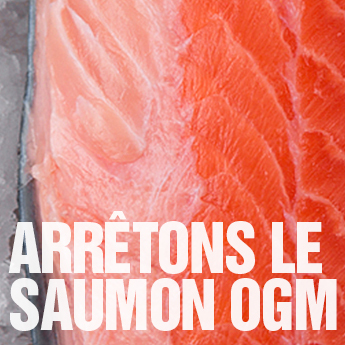 Here is the statement, in French released on April 9 by four farmer organizations in Quebec including the Union des producteurs agricoles (Union of Agricultural Producers). 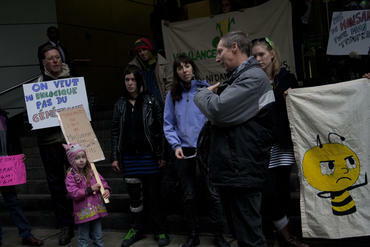 Thibault Rehn of CBAN Member Group Vigilance OGM speaks to a journalist from La Press, at the Montreal rally. And here is what he said: Watch the video from La Press, in French. 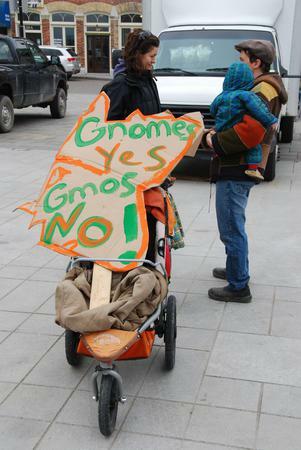 “We want organic, not genetic.” “Monsanto harvesting all the profits.” Montreal. 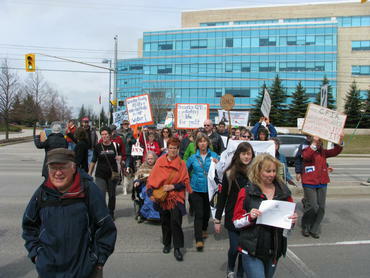 Rally in Lévis. 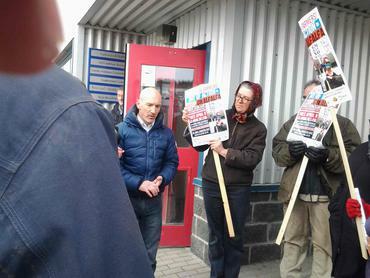 Outside the office of Steven Blaney, MP for Lévis-Bellechasse et Les Etchemins, Quebec. 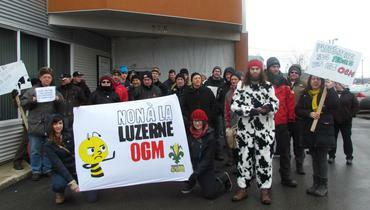 Here is the article, in French, from Le Devoir, about farmer resistance in Quebec. Félicitations tout le monde! 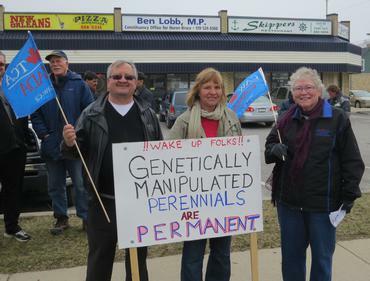 Info Picket in Barrie Ontario! 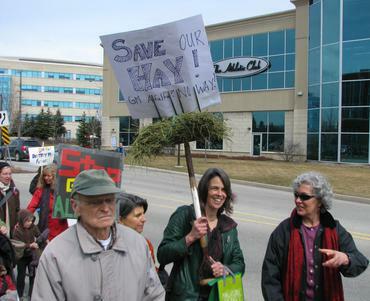 Folks in Barrie Ontario collected 200 signatures on the petition to stop GM alfalfa! 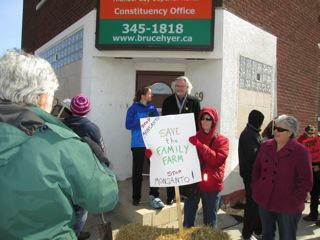 On April 9 local farmers and consumers headed out for this information picket outside their MP office. 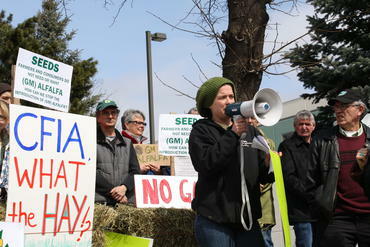 Farmer Sharyn Rutledge of Allensville joined in and said: “I don’t want any genetically modified product near my farm. If it’s nearby – the bees pollinate everything.” You see more photos from Barrie and read the local story here! The rally takes to the street! Belleville, Ontario. 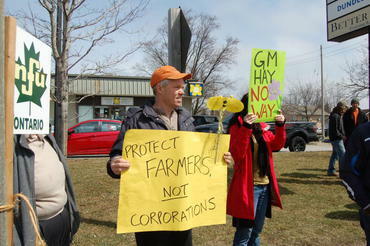 On April 9, Malcolm Allen, MP for Welland and NDP Agriculture Critic was on the road for meetings about food issues with local people. Ian Edgar and Cathy McGregor Smith from the National Farmers Union made sure to present Malcolm with over 1000 signatures on the petition. Goderich, rural Ontario. 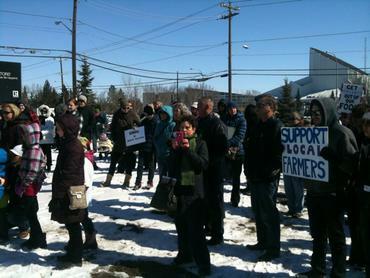 About 50 people, with a number of farmers including young farmers and young people. 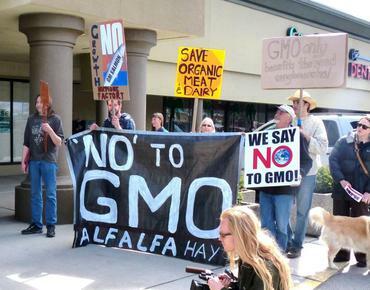 “GM alfalfa is not needed or wanted by farmers. It will become another [herbicide] resistant weed in soy and corn fields,” said Tony McQuail, President of the Huron National Farmers Union local. 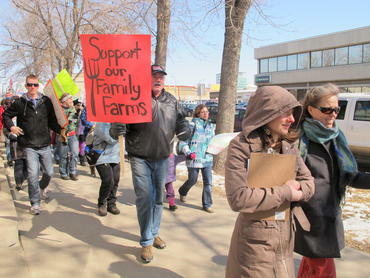 The rally was hosted by the National Farmers Union Locals Bruce 320 and Huron 335. 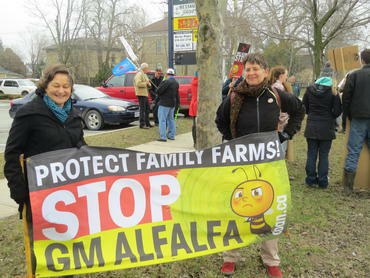 Extra “Stop GM Alfalfa” banners were printed for the campaign by Harmony Organic! 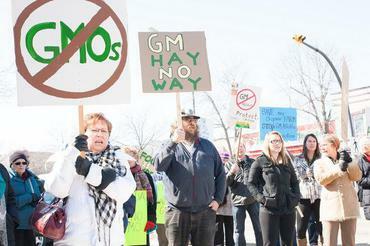 “250-300 people showed up at our rally in Guelph!!! What an amazing turnout and what a wonderful and colourful group of people! There were costumes, masks, props, amazingly creative signs, banners and chants. The young and beautifully aged, farmers, students, mothers and fathers…all full of life, love and a powerful commitment to a healthy, safe and sustainable world. Love was all around. We handed in 1067 petition signatures to our MP Frank Valeriote who will deliver them to the House on our behalf. Many thanks to all who came out to make this a most splendid day! Many thanks to Artisanale for the wonderful street food!” – local Guelph organizer Donna Jennison. 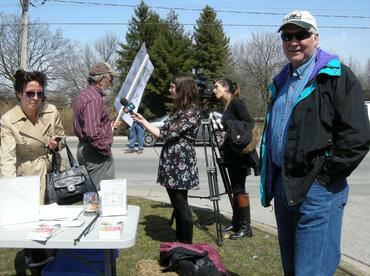 The action was organized by NFU Local 340 – Waterloo/Wellington, the Council of Canadians-Guelph Chapter, Guelph Wellington Coalition for Social Justice, OPIRG-Guelph and the Canadian Biotechnology Action Network and supported by local business Artisanale French Country Cooking who prepared lunch with! 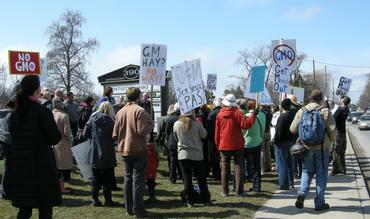 Marching to the Monsanto office in Guelph! Check out some of the footage including the thoughts of Jodi Koberinski (Organic Council of Ontario), Linda Laepple (NFU-O) and farmer Paul Noble among others. The jolly crowd at Guelph! 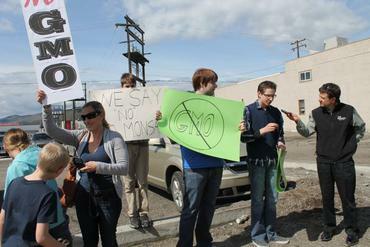 After marching to Monsanto’s office down the street and eating a great GMO-free lunch! Alfalfa is important feed for cows and horses! Local organizer Norah Chaloner presents the petition with over 1000 signatures to Guelph MP and Liberal Agriculture Critic Frank Valeriote. 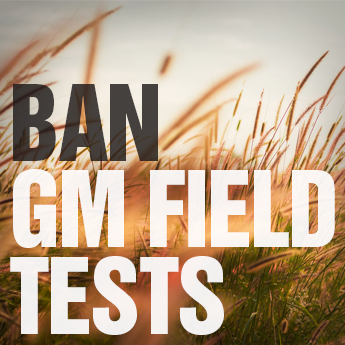 Frank announced that he had submitted a motion for a moratorium on Roundup Ready GM alfalfa to the House of Commons Standing Committee on Agriculture and Agri-Food. 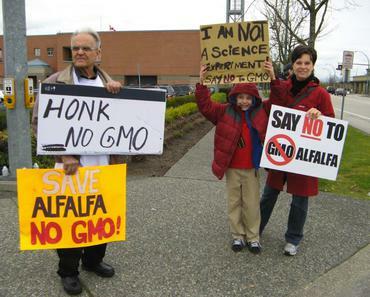 The motion reads: “The Committee recommends that the government place a moratorium on any approval of Roundup Ready Alfalfa until the Government completes public research: (a) into Canada’s ability to ensure the genetic integrity, production and preservation of a diversity of genetically modified organisms (GMOs), non-GMO and organic alfalfa production; (b) the ability of Canada’s handling and transportation system to ensure segregation of forage seeds and detection of genetic co-mingling in alfalfa seeds and hay; (c) the development of industry-led, third party audit and verification systems and (d) that these findings be reported back to the Committee.” The motion has yet to be debated. “Ed’s office gets a LOT of drive-by traffic, so this was huge in spreading awareness for the cause!” – rally organizer Malorie Knoester. 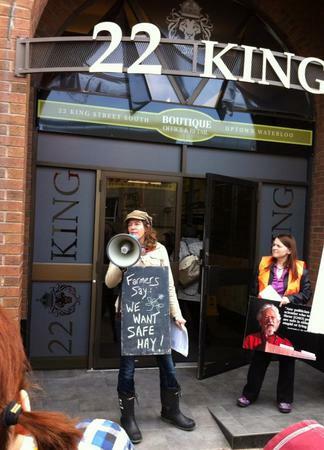 London Ontario, outside the office of MP Ed Holder. Photo Credit: Will Dancey. 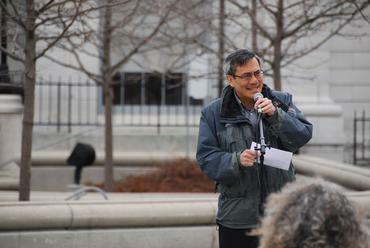 100 people rallied on a sidewalk outside the office of Member of Parliament Peter Braid, which is right in the centre of downtown Waterloo. The rally essentially took up a whole block. 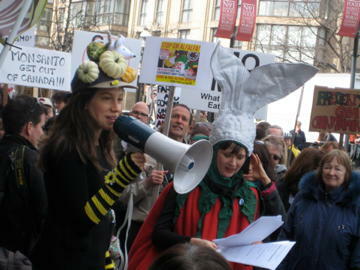 Pictured here at the megaphone is organic vegetable farmer Angie Koch, and in the reflective vest is concerned eater Kelly Wilson. A beekeeper and another farmer spoke. 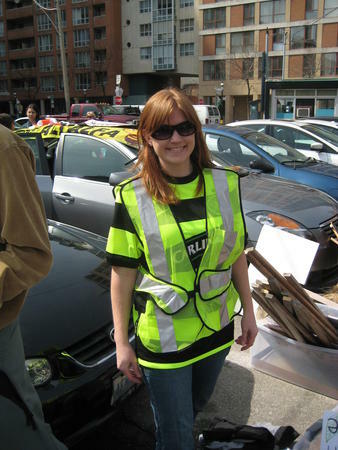 Check out the on-the-street CTV news report from downtown Kitchener! 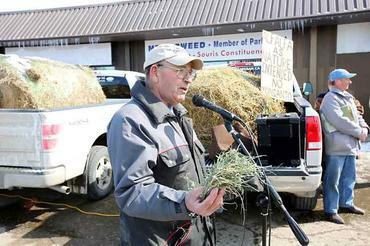 “Our MP Peter Braid come out half way through, and spoke to us for about 15 mins. He thanked us for participating in our democracy, and then we had a spontaneous Q and A. 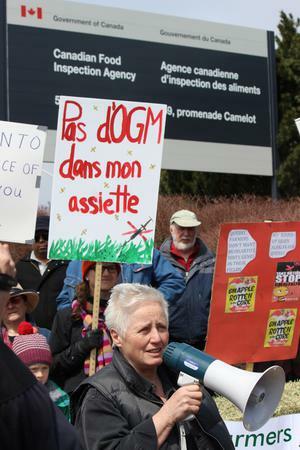 Several people – farmers and eaters – spoke up, and all were, very articulate and brought up some great points re: need for better regulation, need for farmer consultation, contamination risk, GM Alfalfa being a violation of farmer choice etc. Braid’s primary response was that we have a stringent science based regulatory system that is capable of making these decisions. I presented him a package of information, and he said he looks forward to educating himself on the issue.After the protest we presented him with the petitions from the protest and from a health food store that has had them out the past couple of days. 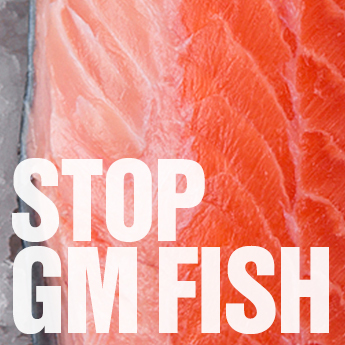 approx 230 signatures.” – Taarini Chopra, CBAN Campaigner, Kitchener Waterloo, Ontario. Can you find the surprise rubber duckie in this photo? 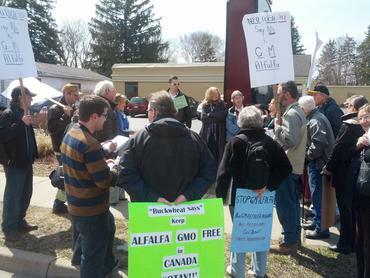 Folks in Kitchener Waterloo Ontario gather around their Member of Parliament to discuss GM alfalfa concerns. Ottawa, outside the CFIA office! 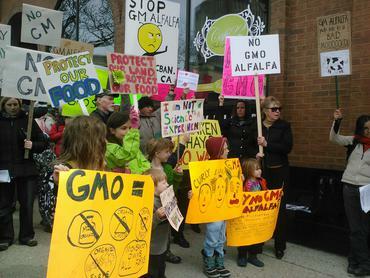 Over 100 people gathered outside the Variety Registration Office of the Canadian Food Inspection Agency (CFIA) on the outskirts of Ottawa – this is the very office where the final signature to allow Monsanto’s Roundup Ready GM Alfalfa will be made – or not! 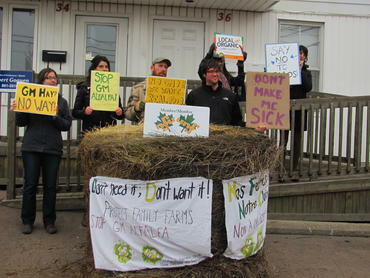 The action was hosted by National Farmers Union Local 362 – Stormont, Dundas, Glengarry, Ottawa, Prescott-Russell; 310 – Lanark. Watch the great news video report of the action here! Farmer Coral Sproule at the megaphone, Ottawa. 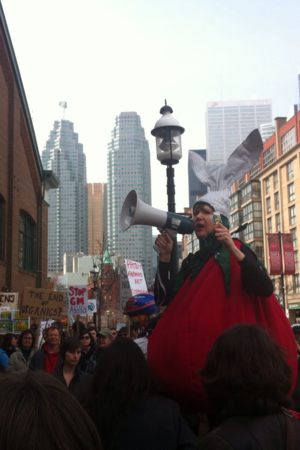 Coral Sproule, Regional Council Member of National Farmers Union Ontario, at the megaphone! We all learned how to use the megaphone on April 9! One by one, local farmers from surrounding areas spoke about how GM alfalfa would affect them, including local honey producers. And then there was organic cake! Ottawa. 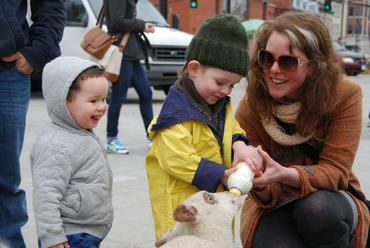 Small calf at the Day of Action! 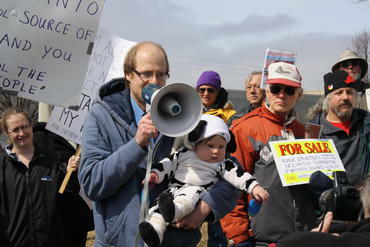 Paul Slomp, local grassfed beef producer and Vice President (Operations) of the National Farmers Union, at the megaphone with his baby Felix, dressed in his cow costume! Ottawa. 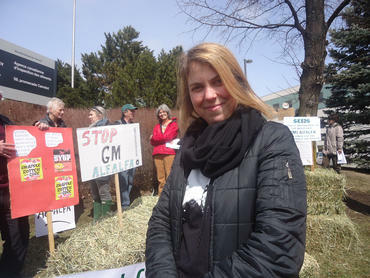 CBAN’s Graphic Designer Jenny Walker at the rally in Ottawa! Thank you Jenny for designing posters, flyers, web graphics, info graphics, handouts, and reports for the Day of Action! 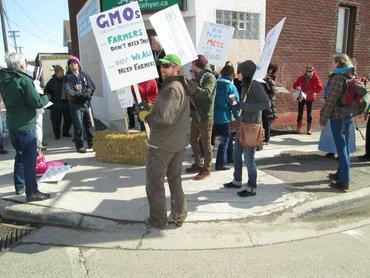 Over 100 people rallied in Owen Sound Ontario outside the office of MP Larry Miller, who used to be Chair of the House of Commons Agriculture Committee. 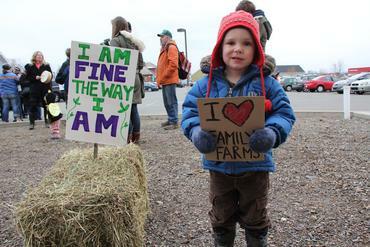 Young farmer Nathan Carey spoke at the rally. He said: “I’m deeply moved and inspired by all of you today. Your concern and passion for this issue resonate in me and inspire me to keep fighting. Our reward for making a stand is to create the more beautiful world our hearts tell us is possible. The future we want is present right now in our stand, in our opposition to this insanity called GM Alfalfa.” Read Nathan’s whole speech. You can listen to short audio clips from Ann Slater from the National Farmers Union Local 341 which hosted the rally. Ann says they are not finding a lot of farmers that want Monsanto’s GM Roundup Ready Alfalfa. Stratford, Ontario. 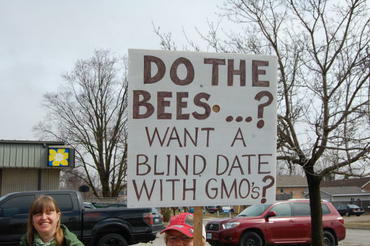 Do the Bees Want a Blind Date with GMOs? Dairy farmers Ron and Deb Vice spoke at the rally in Toronto! “Thank you so much! We had such a wonderful day! We came home so thankful that so many people really do care. Thank you for all your hard work to organize these events.” – Ron and Deb Vice. Thank you Ron and Deb for coming to the city to share your knowledge and concerns! 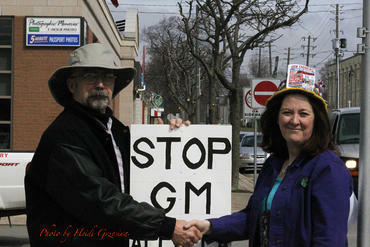 Crowd marshal volunteer Heather Lee of No More GMOs Toronto! 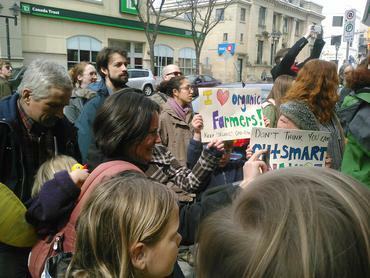 The St Lawrence Market would not permit the rally on their premises so the rally was planned for outside, on the sidewalk. Thank you local organizers who worked so hard to organize the logistics and make sure everyone would be safe in the big city! Rachel in her Squash Hat! Possibly the first time this century that a hay bale has made its way into Toronto! 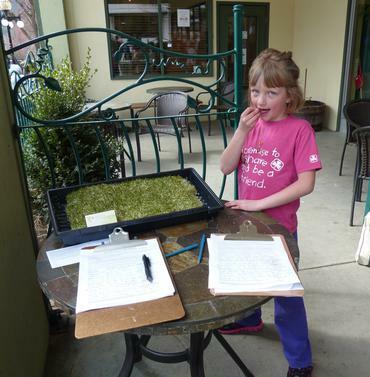 Alfalfa is a legume that is often part of a mix with grasses for hay! In the picture: urban market gardener Debbie Nolan and Sarah Bakker of Field Sparrow Farms (grass-fed beef and pastured pork) and the National Farmers Union Ontario. We agree Toronto! “Food Bee-longs to everyone”! 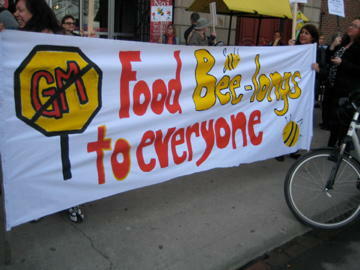 This great banner was made at a banner-making party hosted at The Big Carrot and organized by No More GMOs Toronto, Occupy Garden’s Toronto and the Toronto Seed Library. Thanks to Lilian from the Kids Right to Know March for bringing supplies! 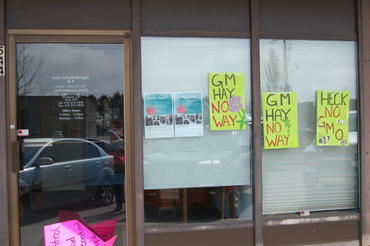 Thunder Bay says No GM Hay! 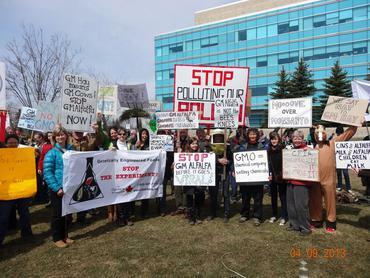 54 people came out in Thunder Bay Ontario! 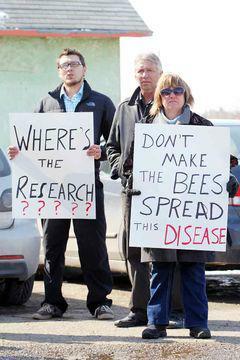 This action was organized by Ann McGoey, local beekeeper, retired nurse practitioner and grandmother of 4! To the left you will see another beekeeper. 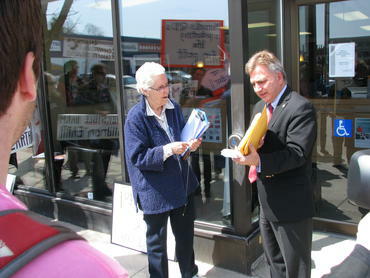 People in Thunder Bay presented a total of 107 signatures on the petition on April 9. 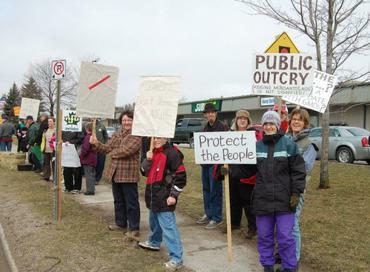 Some were presented to MP John Rafferty MP (NDP) who is pictured here standing behind the sign, and some were given to staff inside this Constituency Office of MP Bruce Hyer’s (Indep.). Youngest participant Gretchen Mills (7 weeks old) with mother, Maureen. Office of the Minister of Agriculture in rural Saskatchewan! Paul Schneider drove his tractor to the Calgary rally! 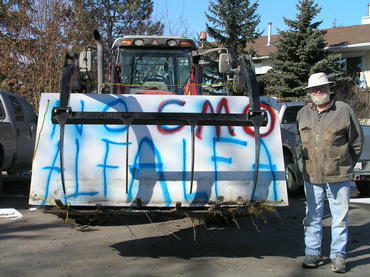 Paul Schneider brought this sign on his tractor to the rally outside the Prime Minister’s office in Calgary! “I am an organic farmer and I grow alfalfa hay for my cattle,” he told Global News, “Even if I don’t seed GMO alfalfa, my crop will eventually get contaminated by bees transferring the pollen.” Watch the Global News report here. 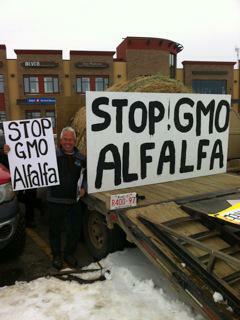 Calgary crowd says “No GMO Alfalfa” in really big letters! 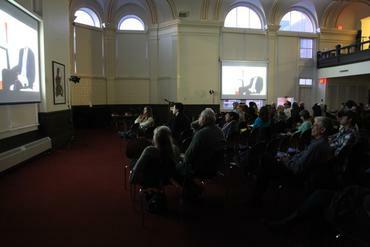 About 120 people came out in Calgary! 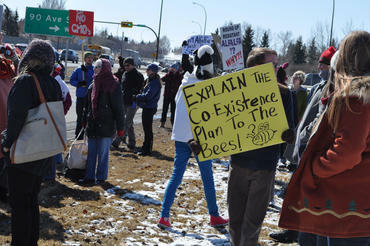 “Explain the Coexistence Plan to the Bees”! 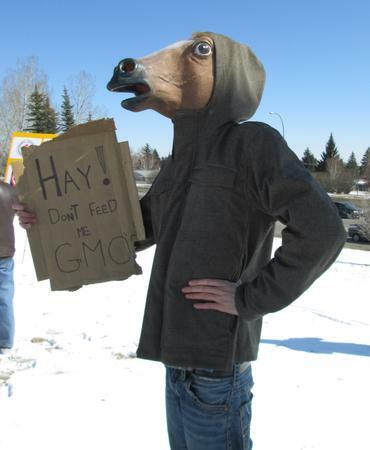 The biotech and seed industry, under the Canadian Seed Trade Association, is attempting to create a “coexistence” plan for GM alfalfa – to sell the idea that contamination can be prevented, as a way of introducing GM alfalfa over the objections of farmers. Tell it to the bees! 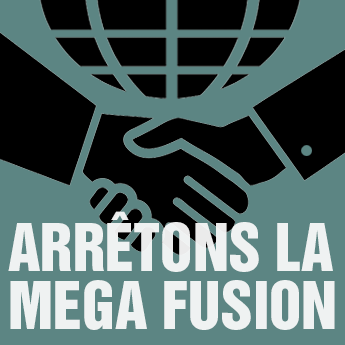 The week before the Day of Action, the Canadian Biotechnology Action Network published the report “The Inevitability of Contamination from GM Alfalfa Release in Ontario” which exposes how ridiculous the idea of coexistence is. Calgary, Alberta. “We had about 100 people turn up in very cold weather.” John Schneider from Gold Forest Grains and Doug Scott, who is a wheat and canola farmer and Coordinator for Region 7 (Alberta), spoke at the rally. Edmonton Alberta! 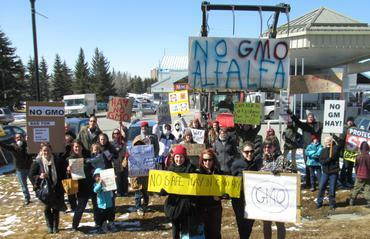 With just a few days notice, 33 people came out in Grande Prairie Alberta, an important alfalfa growing area of Canada. 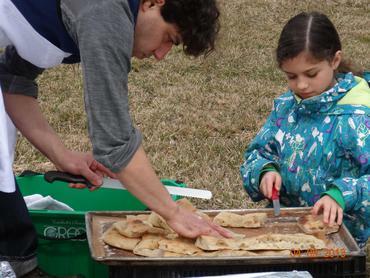 Check out the great local newspaper story including more great photos. 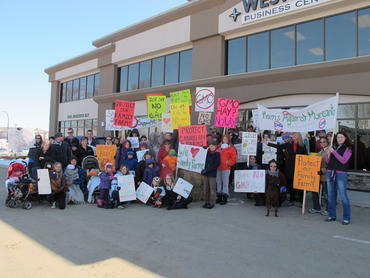 Everyone met at Red Deer City Hall and walked to the Office of federal MP Earl Dreeshens! Some took hay along for the walk! Red Deer, Alberta. 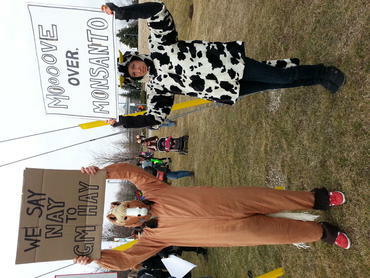 Marching to Stop GM Alfalfa – a great way to stay warm on a cold-ish April 9 in Red Deer Alberta! 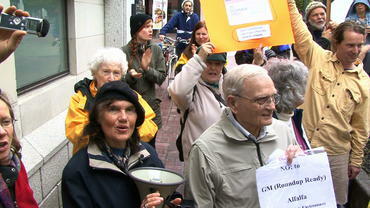 The rallies were part of ongoing community and movement building. 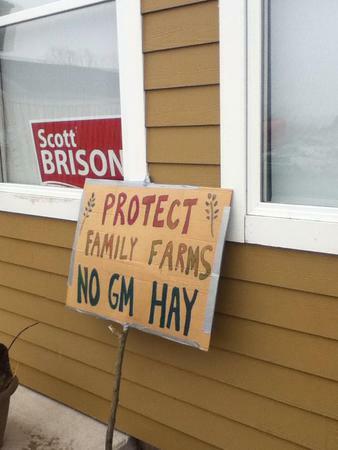 “Protect Canadian Farms”! Red Deer, Alberta. This is the photo that made it to the front page of the local paper in Camrose, Alberta. Folks in Camrose met at the University to make signs and prepare for the rally and then walked to the office of Kevin Sorenson, MP for Crowfoot. 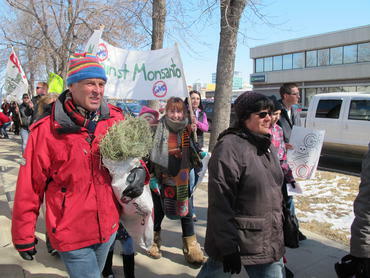 Rally organizer Takota Coen invited people to speak before highlighting his own concerns: “I would like to say that as a young person who is interested in becoming a farmer this genetically modified alfalfa, as well as other GMO’s is basically scaring me away from following my dream of becoming a farmer,” he said. 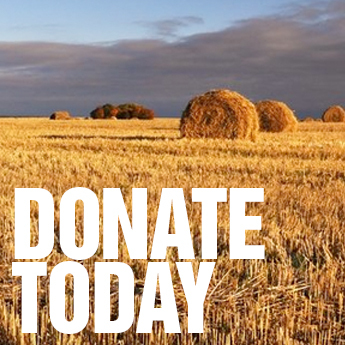 “Things like this will prevent me from farming the way that I feel is best.” Camrose, Alberta. 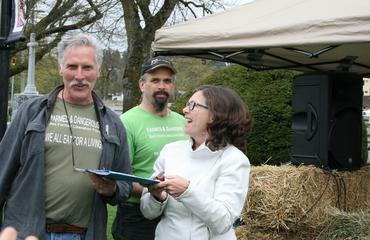 Around 75 people came out to this great event organized by the Cowichan Green Community (CGC) and the National Farmers Union Region 8 (BC-Peace River), in Charles Hoey Park, Duncan BC! 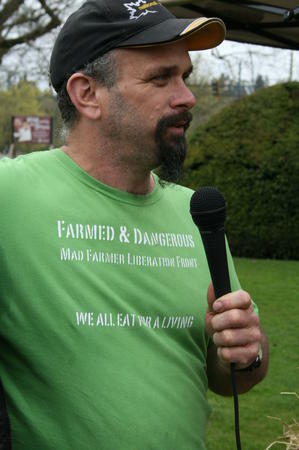 Dan Ferguson, Director for National Farmers Union Region 8 (BC-Peace Region) is “Farmed and Dangerous”. 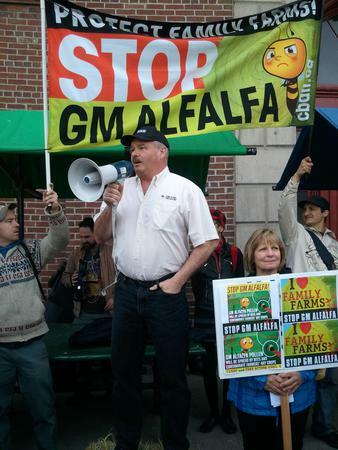 Dan helped organize the rally and is pictured here answering questions from the crowd about GM alfalfa. Dan said “This is not just a ‘conventional versus organic’ farm battle; it’s all farmers standing united, across our nation, rallying for democracy. The only people that seem to want this product are seed and fertilizer company representatives. The NFU is comprised of all sizes and kinds of family farms nationally, and we are asking for all Canadians to help us keep Alfalfa clean and free of transgenetic manipulation.” You can read the Press Release from Duncan BC here. 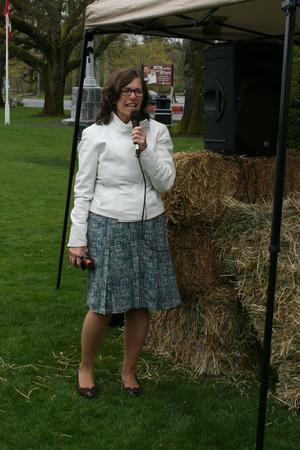 Jean Crowder, Member of Parliament for Cowichan-Nanaimo spoke in support of a moratorium on GM alfalfa.”Farmers are rightly concerned that introducing a genetic modification to a crop that already works well for farmers, doesn’t suffer from heavy pest infestation, and is easily cross-pollinated may have unanticipated consequences,” she said in a column she published in support on April 9. 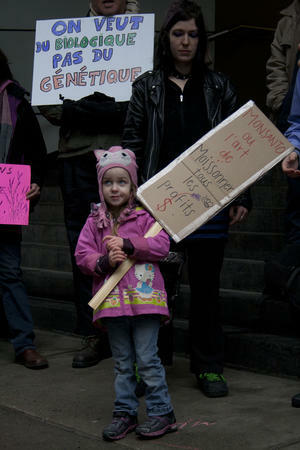 She announced that the NDP have called for a moratorium on GM alfalfa! 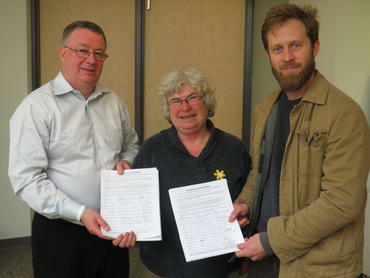 Eric Veale presenting 200 signatures from Gabriola Island residents to Jean Crowder, Member of Parliament for Cowichan-Nanaimo. (Gabriola Island is just off the coast of Nanaimo, BC.) Duncan, BC. 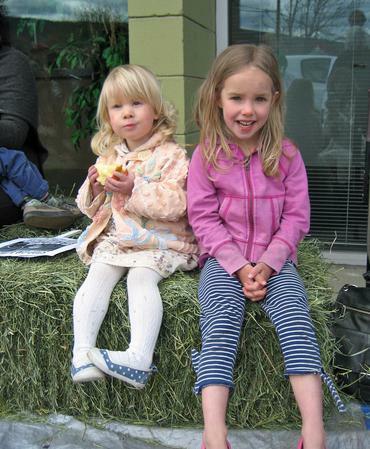 Haybales are perfect child-size chairs at the rally! 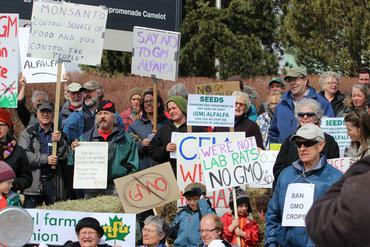 From the action hosted by the Shuswap Thompson Organic Producers Association (STOPA) in Kamloops BC! 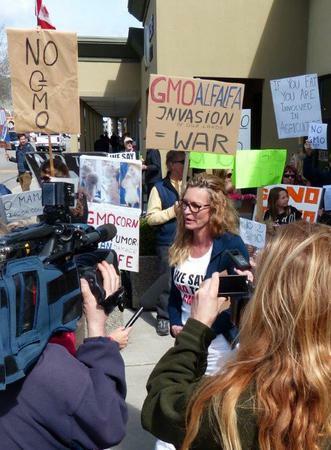 Between 50-100 people joined the Kelowna BC rally organized by Heidi Osterman of the True Food Foundation, pictured being interviewed by media. 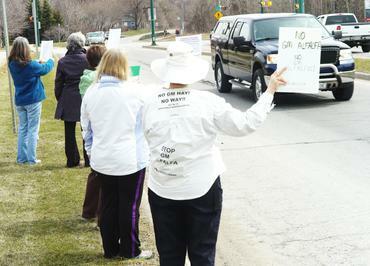 “Here in Kelowna we held a protest outside the mall entrance where MP Ron Cannan has his office. 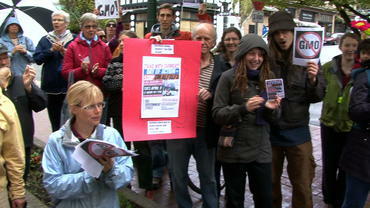 Over 50 were there with signs and were signing petitions ..and we had several media reporters. 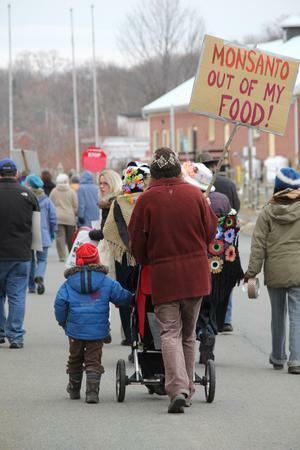 Heard a report on the radio this morning when I woke up…Heidi Osterman and the True Food Foundation were central to the success of this day’s activities,” said local activist Carol Kergan. 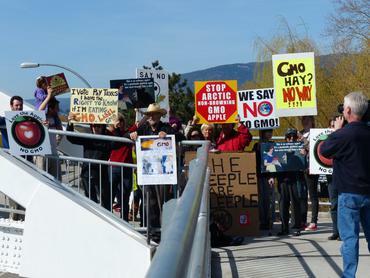 Watch the Global TV News report from Kelowna here! 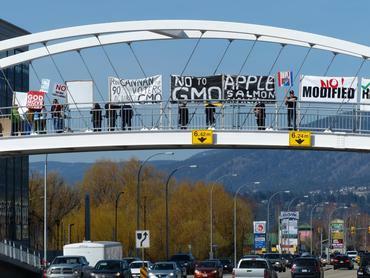 The Kelowna rally took to the bridge! 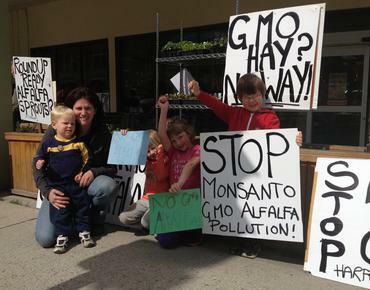 Heidi Osterman of the True Food Foundation delivered 1,007 signatures on the petition to stop GM alfalfa to Member of Parliament for Kelowna-Lake Country, Ron Cannan, (Conservative) who presented them in the House of Commons. 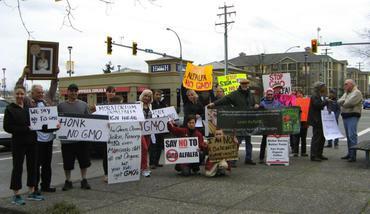 Awareness raising from the street in Langley BC, in a rally organized in 2 days by GE Free Langley! Congratulations everyone! 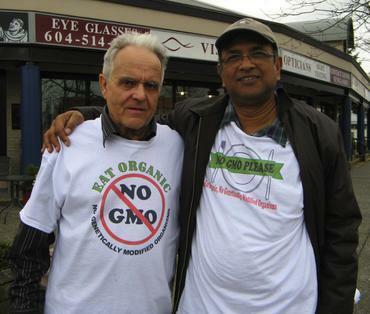 Its Wally Martin, owner of Princess and the Pea B&B in Langley which serves non-GMO breakfasts to their guests! with Tony Mitra, member of the group AID (Association for India Development) which is dedicated to helping small farmers in India transition from chemical farming to ecological agriculture. Langley, BC. 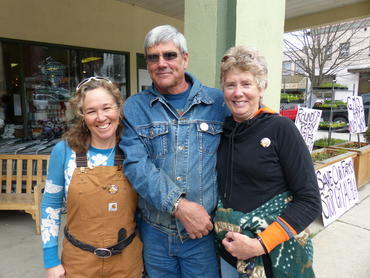 Wally Martin and Terri Lynn Sullivan, a Langley mom who grew up on a farm. 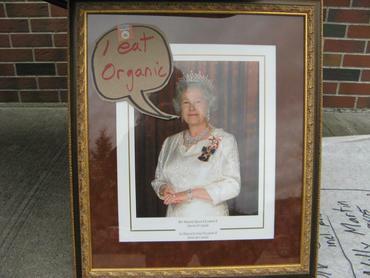 Even the Queen was out in Langley BC. 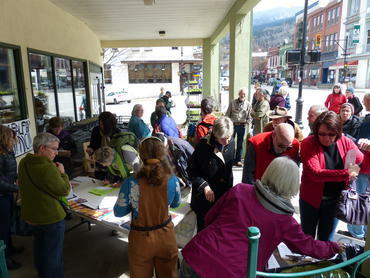 Petition-signing, information-sharing and rally outside the Kootenay Coop in Nelson BC! Organized by The National Farmers Union; Kootenay Lake Agricultural Society; Kootenay Organic Growers; West Kootenay Eco Society. Small children learning how raise their fists in protest! 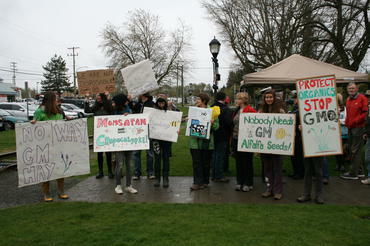 One of many early lessons from the Day of Action to Stop GM Alfalfa! That, and how to make great signs! “GM Hay? Now Way!” Pictured here with Laura Stravast of Meadowbrook Farm. Nelson BC. Everyone is so friendly and cheery! Here is Colleen Ross, Vice President (Policy) of the National Farmers Union with Margo and George Wilson of Meadowbrook Farm. Nelson, BC. Yummy organic alfalfa sprouts! The first GM alfalfa seeds are not designed for sprout growers and many would avoid GM alfalfa seeds, but sprout farmers are very worried about contamination of their seeds. 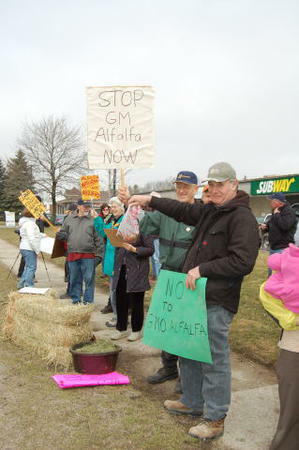 More than 50 people came out to the Vernon rally organized by Kelsi Evans who was quoted in her local paper as saying, “GM alfalfa could be released on the market any day but farmers and young consumers like me don’t need it and we don’t believe in it.” Kelsi is 21 and was joined at the rally by many secondary school students. Congratulations Kelsi and everyone! Vernon BC. 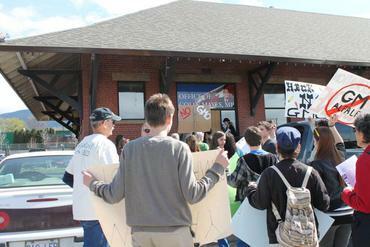 About 80 people participated in Vernon and 150 signatures were collected to give to the local Member of Parliament! 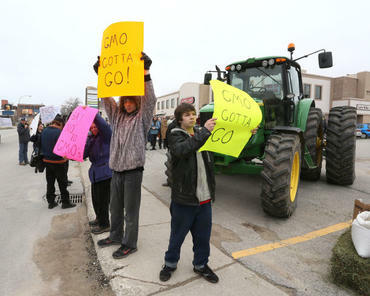 The Vernon Morning Star reported: The number of youth that turned out to the event was impressive to the experienced farmers on site – from young activists like Evans to even a few toddlers waving signs alongside their parents. Facebook and word of mouth were key to the turnout, said Kelsi Evans. 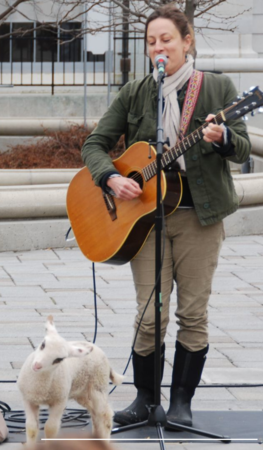 “I went around all over Vernon, I went to the bottom of hospital hill and protested on my own and just tried to make it happen.” – Thanks for organizing the rally Kelsi! Kelsi also presented petitions to her local MP. 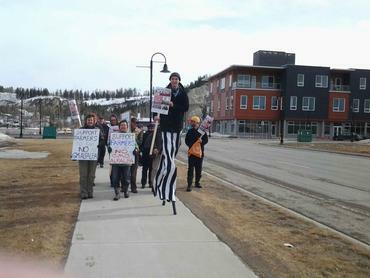 Yukon farmers marched to their MP’s office in Whitehorse. Here Graham Rudge is on stilts! 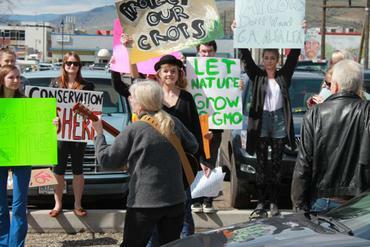 The action was hosted by Growers of Organic Food Yukon (GoOFY). Ryan Leef Member of Parliament Yukon (Conservative) came out and spoke at length with concerned citizens. 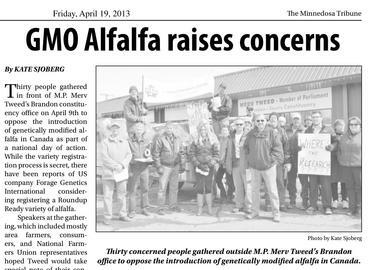 He presented their petition to stop GM alfalfa in the House of Commons on May 10, 2013.